I'll dispense with the usual stuff about the F-16 andconcentrate on the ones built in Europe, specifically the Dutch and Belgian AF.These are basically early A models. Were they USAF ones, they'd have 78- and 79-serial numbers. 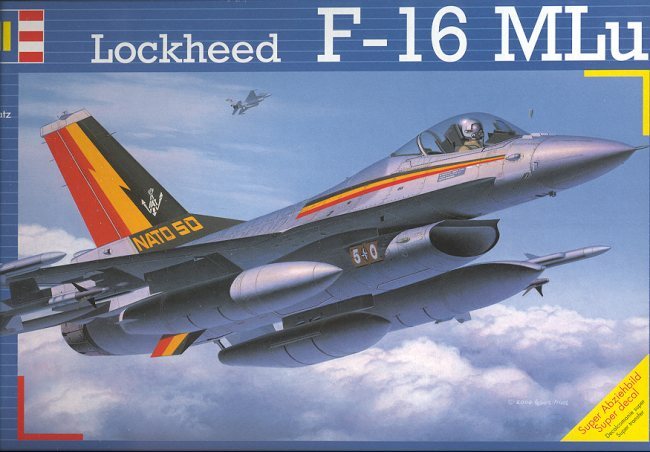 Now one of the nice things about the F-16 is that they arerelatively rugged and are able to handle all sorts of updated to even theearliest airframes. After a good twenty years of service, these F-16s were gettingto where they needed to be replaced. In those intervening years, the cost ofmilitary equipment had skyrocketed. It was decided that the best thing to dowould be to upgrade the aircraft. As with most modern military planes, thismeans basically an avionics upgrade allowing the F-16 to operate new weaponssystems. Thus, the Mid-Life upgrade (MLu). The upgrade involved over 300airframes and will extend the life of these planes until around 2015. My particular kit arrived with a number of pieces broken off the sprue and thestatic dischargers on the rudder broken off. A problem that is caused as much bypacking everything in one bag as much as it is with the open at the end box thatRoG and other European companies like to use. Anyway, I knownearly diddly about most modern aircraft. When I left the service, my interestin modern jets sorta went with it. However, I did know that this modificationprogram was going on, and was wondering when someone would eventually come outwith a kit of these planes. 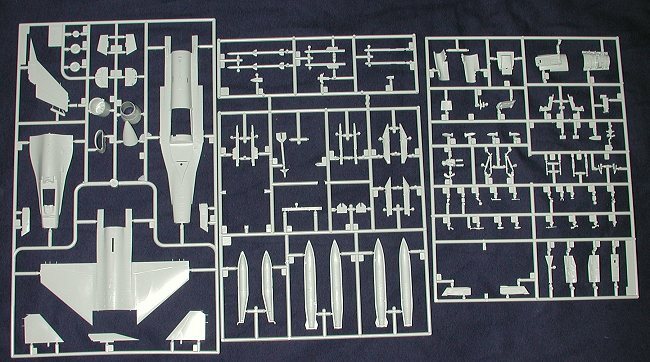 Modern jet builders have been awaiting this kit fora long time and it looks well worth the wait. Parts are crisply molded and up tomodern standards. As you can see, it appears that the sprue is set up for atwin-seater as well, though not sure if it will ever show up. Let'stake a closer peek. The cockpit is quite adequate offering the option of decalsor not for the instrument and side panels. Seat looks ok to me and the kit comeswith a pilot! The canopy section is the one that appears to be interchangeablewith a two-seater and I'm not sure how this part will fit until the kit getsbuilt. You have two different fin housings depending on whether you are doing aBelgian or Dutch aircraft. Other differences between Dutch and Belgianrequirements are supplied in the kit. There is a cutout in the upper nose forthe 'road warrior' antennas that are part of the MLu. The canopy can be positioned eitheropen or closed, though there is no ladder in with the kit. There are nine pylonssupplied with the model. Thanks to the single piece wings, you have no optionregarding opening holes for these as they are already molded open for you. So,what can you load on this aircraft? Well, there is a centerline tank and twolarge drop tanks. The kit comes with both Sidewinders and AAMRAMS. You can do'winders on the tips and the others under the wings or vice versa as the propermounts are provided. What you don't get are anything for the midwing racks.These would normally carry bombs, so you need to raid the spares box for these. Instructionsare more than adequate and very good. What is really neat are the decal options.There are decals for no fewer than seven schemes. There are three Dutch ones for312 and 322 Squadrons as well as the MLU Operational Test and Evaluationunit. The Belgians have always had some very cool special schemes for theiraircraft and one of the four is for the 50th Anniversary of NATO. I imagine thatmany will use this scheme. There is also a scheme for 2 Wing and 31Squadron withtheir new tail codes. A Belgian marked MLU OT&E bird is also given. Azillion stencils are part of the decal suite, so final construction of this kitwon't be a quick one! Overall, it looks like a very nice model.It just arrived in the local hobby shops and is sure to be a good seller. Many thanks to BurkhardDomke for getting this kit for me. It ismuch appreciated!